Seville Cleaners was established in 1999. We have built a reputation for reliable customer service. Our cleaners aim to provide excellent cleaning and pressing services at an affordable price to the communities in Scottsdale, AZ. You can view the entire operations as we’re housed in an open, attractive location. Whatever your dry cleaning and laundry needs are, we have you covered. Seville Cleaners is a locally owned business. Rest assured that our trained staff can have your order ready the same day if you drop it off in the morning, or the next day if you drop it off later. At Seville Cleaners we truly are committed to providing the best quality and service. Get any garment dry cleaned and pressed at $3.00. Sign up for FREE dry cleaning on your second visit. John Sheppard has been the owner of Seville Cleaners since it began its operations in 1999. From greeting his customers to taking orders, you’ll find John is involved in each operation. John actively takes part in the assembly area where orders are put together and quality inspection is performed. Previously, John was in the golf business in Houston, Texas. He learned the fundamentals of customer service while working extensively at the pro-shop. 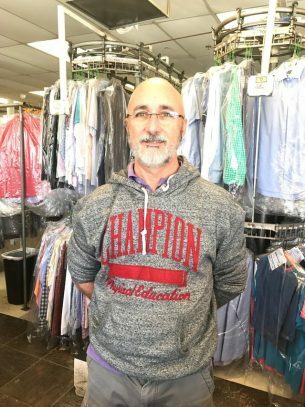 John is still an avid golfer, but his main focus is on the dry cleaning business. John greatly values his customers and staff and his business. Ask for John when you are visiting the shop for the first time.